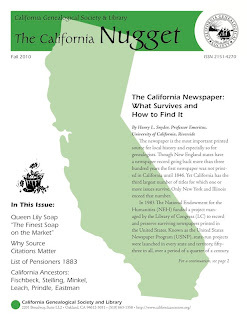 The Fall 2010 edition of The California Nugget has been sent to the printer and should be arriving in members' mailboxes next week. It's another information-filled issue by Editor Jane Hufft and Production Editor Lois Elling. True to the title of our publication, we have a goldmine of articles for you in this issue. In our “Twenty-First Century Genealogy” section, Dr. Henry Snyder, Professor Emeritus of U.C. Riverside, writes about the current state of California newspaper digitization, a topic of enormous importance to anyone conducting research in the golden state. An expert in the subject, he is the former director of the Center for Bibliographical Studies and Research at U.C. Riverside. Thomas MacEntee, a professional genealogist specializing in the use of technology and social media to improve genealogical research, makes the case for careful and thorough citing of sources, a must for twenty-first century genealogical research. Twenty-first century genealogy also requires that the society embrace the electronic world. 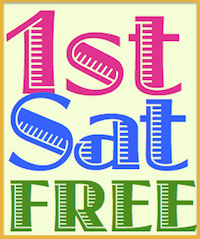 As society member Cathy H. Paris explains in her article “Lulu Comes to California Anccestors.org,” we are doing exactly that by using print-on-demand services for our newer books to expedite publishing. 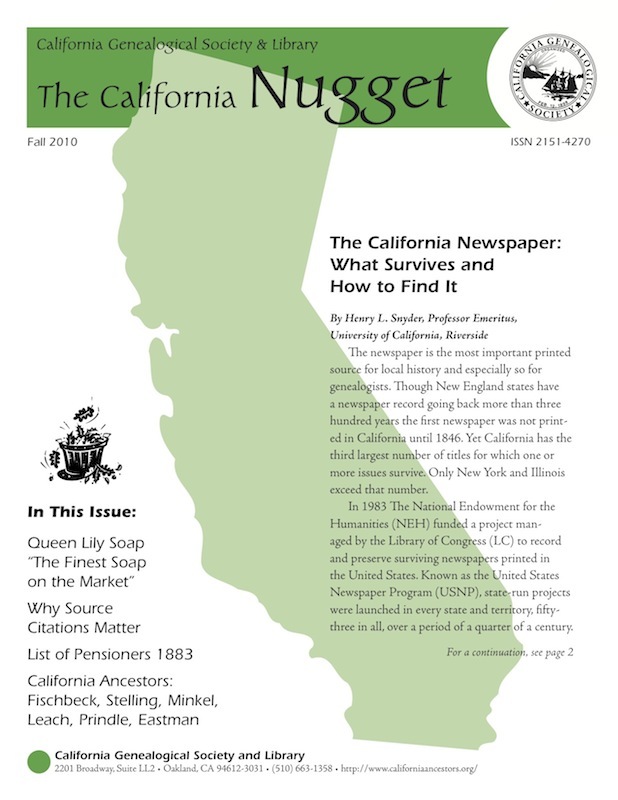 Our “California Ancestors” section features an engaging account from CGS member Janet Brewer Forsburg, whose immigrant ancestor’s successful company was widely known in the Bay Area. CGS manuscript specialists Virginia Turner and Georgia Lipinsky assisted with the preparation of this remarkable story. Kathleen C. Beals, author of many genealogical and history titles, including Early Families of Unity, New Hampshire and San Francisco Marriage Returns, 1850 – 1858, describes how a second look at previously completed research on Simeon Leach unearthed fresh and surprising mate- rial. The 1883 List of Pensioners appears here alphabetically by pensioner which makes this compilation unique. With winter coming, curl up with one of the new titles reviewed by Marston Watson, a professional genealogist specializing in New England genealogies, and author of three volumes on Royal Families: Americans of Royal and Noble Ancestry. We have a splendid list of new books, the names of many new members, and a brochure for you to use for ordering any of the society’s publications. Please note that Part III of “Finding the Laughran Sisters” will appear in the Spring 2011 issue.